My first real stint of traveling occurred when I studied abroad last year. Because I was the first of my friends to go abroad, I didn’t know what to expect and didn’t have tips on how to travel well when I took weekend trips. The first time I stayed in a hostel, I was horrified. It was in Edinburgh and my traveling buddy, knowing no better, booked the cheapest place she could find. With somewhere around 18 other guests in the room, beds were triple-bunked, the air was stuffy and stinky, at least one person was always snoring and I never felt more uncomfortable. I stayed in an even crustier hostel in Brussels towards the end of my time in Europe (which included multiple other stays in other hostels; though less crusty, I was still scarred by Edinburgh). As I was showering in an ice-cold shower littered with band-aids and hair, I vowed I would never, ever stay in a hostel again in my life. Airbnb 5ever. And then came my three-week trip to Europe this spring traveling with my sister. We discovered that Airbnb prices split between only two people would put an irreparable dent in our travel budget. I could either sleep on the streets or I could sleep in hostels. To my surprise, I chose hostels. In a small room, there are less people to make noise and – you have to face the reality – potentially steal your stuff. It’s also easier to get to know your roommates in a small room, in my experience. Four to eight beds are the room sizes I like best. Though small rooms are more expensive than large ones (single or double private rooms being the most expensive), they’re still very reasonable. One night I was in a mixed gender room and the next night I was with all females. The increase in comfort I felt the second night was massive. I didn’t feel uncomfortable wearing a sports bra to bed or walking around in a towel after showering. It was also easier for me to connect with people of my gender. This one is obvious and self-explanatory, but it’s important. Luckily, I’ve never had anything stolen from me so I’m not speaking from experience here, but that may be because I take excessive precautions to make sure my belongings are safe. Therefore, always lock up your stuff. You never know what your roommates will be like. The downside is locks can add a couple pounds to your luggage, but most hostels have locks to rent if you have the change for that. If you don’t have access to a lock or lockable compartment, I find it reassuring to sleep with my most important possessions close to me on my bed. After contracting lice from the last hostel I stayed at while studying abroad, there was no way I was going to risk my chances during my three-week trip, so I brought my own pillow case. I felt cozier when settling down to sleep, plus it was a small reminder of the comfort of home. It’s also small and light enough to easily pack without it being a burden (in contrast with a whole set of sheets). 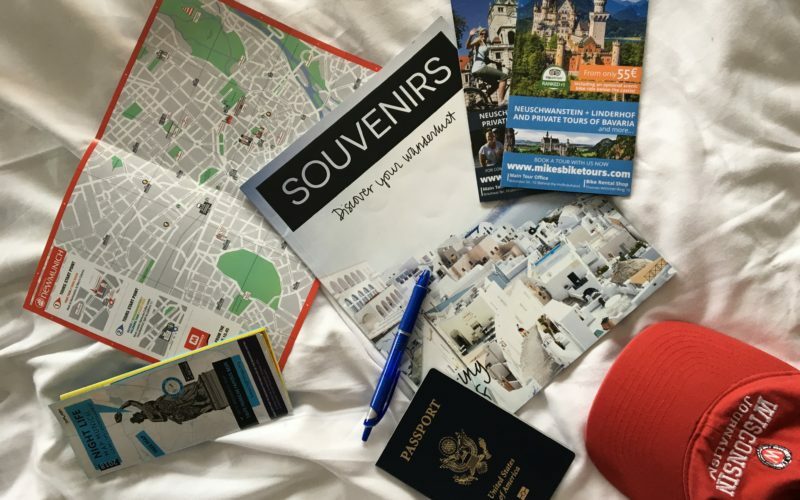 If you are, however, totally against hostel sheets, read about how Souvenirs staff writer Paige avoids them with a Silk Sak. After that nasty af shower in Brussels, I learned my lesson to never go barefoot in a hostel shower again. Flip flops not only help your feet feel less gross, but can protect from picking up germs and bacteria that can lead to things like warts and athlete’s foot. Flip flops are super cheap and easy to find at large stores, both in the States and in Europe, and they’re light and slim for packing. I’m a huge snob about noise when I sleep. I literally hate the sound of snoring more than anything else in the world. To block out noise, download a white noise app on your phone and play it with headphones on. Noise-cancelling headphones work the best – you’ll never hear a thing. (I learned this trick when two of my three roommates snored in the quad room where we lived while studying abroad.) If you don’t like sleeping with headphones on, old-school earplugs work just as great too. Additional ways to feel comfier in your bed, as learned by other Souvenirs members, include wearing a sleeping mask to block out light, and hanging up a blanket or scarf if you’re on the bottom bunk to create privacy. The majority of the hostels from my most recent trip did not have outlets on the top bunks (where, naturally, I was assigned to sleep). Luckily, my sister was always in the bunk below me so I could charge my phone on her bed through the night, but it would have been really tricky without her. For my next trip, I’m definitely investing in an extra long phone charger (most go up to 10 feet!) in case that happens again.